AN: Okay – What do you think about Tsogo as a school? AN: That’s interesting – so who’s gone to Tsogo from your family? TM: Well… my Mother went to Tsogo. I think she finished in the late ‘80s. My older sister also went to Tsogo. I obviously just finished at Tsogo last year and lastly my younger sister is currently in Grade 10 at Tsogo. AN: That’s impressive! A school for all generations. What else did you like about Tsogo? TM: The teachers at Tsogo sacrife a lot for us. For example, Mrs. Kgatle taught us Maths on Saturdays – and this covered Grades 10 to 12. So the dedication from the staff is special. I also think the competition in the classes also pushes us. For me Lesego (Phateng) was my main ‘competition’… I really enjoyed the rivalry. AN: It’s true that healthy competition is good – it brings out the best in performance in most instances. What else would you say drove your performance last year and over your years at Tsogo? AN: …Is that the paper with Probabilities, Data Handling? – quite a tough paper isn’t it? TM: Yes it is that paper. I remember the night before the exam, I stayed up till late at night studying and practising. I put myself under so much pressure I couldn’t sleep. And sometimes that’s my weakness – sleeping instead of studying (smiles). AN: I think we all love our sleep – and it always feels much better during exams (laughing). Who kept you motivated during your years at Tsogo? TM: My grandmother is my inspiration. She always gives me words of Inspiration. She’s a very religious person and that Christian grounding has always kept me going. It also helps that we have assembly at school and pray. Last year, the school moved assembly to 3 times a week but this still helps as we need those regular prayers. I also pray before I eat, before I write exams. It’s a blessing that you wake up each day. AN: Going back a little bit…. How did you find your junior years at Tsogo (Grades 7 to 9)? TM: I really enjoyed Tsogo – but I was very shy at first. I specifically remember Mr. Mothata during those early years! He used to always target a group of us sitting together – there were 4 of us. He would always target those shy people he knew had potential. So he made us read outloud in class and got us to participate more – I think this really helped me. He gave me the confidence I needed to express myself. The other thing I’ll never forget is the competition. Lesego and I were in different classes from Grade 7 to 9 but she was always the top student. She started at Morekolodi so she was ‘comfortable’ at Tsogo. All those years she was a monopoly. We met when we got to Grade 10B and I think that’s where the competition really started. It was good because it made us both work hard. AN: What ‘drove’ you from Grade 10 onwards? TM: Mrs. Mohashoa was really an inspiration for me. She taught me Accounting and she really taught us the ‘tricks of the trade’ in accounting! She had her own way of teaching and it worked well for me. After every test, she would read everyone’s results outloud in class so this exposed everyone. This made us all work harder to avoid embarrassment. TM: Definitely true. Also the peer pressure and competition is good – especially if your ‘competitors’ get higher marks. I think Mrs. Mohashoa was very good for me and we got along very well. She really gave me the passion for Accounting. AN: It’s interesting that you’re specifically mentioning her… I’ve also heard some of your former classmates praising her efforts. TM: She is very dedicated. Mrs. Mohashoa really belived in me. She invested a lot of energy in people and she gave me a lot of support – I used to always got to her with questions. Our new teacher Mrs. Mohapi was good but Mrs. Mohashoa was the real motivating force for me. TM: She also organised Saturday classes for some kids – sometimes even teaching on Sundays from her own house in Zone 8. Not everyone attended but those who did, came back and helped everyone else in class. I didn’t attend most of these extra classes because not all of them were free. AN: Were you involved in any other activities throughout high school? TM: I was in the RCL – the Representative Council of Learners (formerly the S.R.C.) from Grade 11 to Matric. I was a part of the RCL Executive Committee…. My involvement however really picked up in matric. AN: So how did you find time to attend to RCL matters with your matric studies getting intense? TM: We used to have meetings at break time so they didn’t clash with school time. We also made time for events – for example we organised an Environment Day event at the school on a Saturday where everyone came in to clean the school – so we tried to work outside school hours. AN: Interesting – so it was all about juggling time around. What was your role in the RCL Committee? TM: I was the TREASURER. AN: Have you always loved handling and managing money? Why did you take the Treasurer position? TM: I love optimizing the potential use of money! I also have numerical ability so managing money came naturally to me. Being responsible for the RCL’s money requires a lot. As the treasurer you’re responsible– if money goes missing you’re the one to blame. To me it was all about maximizing the benefits and use of our limited funds. For example when we had a Fun Day at the school, we had to get food, a D.J. and other things. The money we had wasn’t enough so we had to sit and decide what we could and couldn’t buy and then do a budget. That’s what I love – using money optimally. AN: Do you think you gained valuable leadership skills from being in the RCL Committee? TM: Definitely. It taught me to lead…! I always used to be a follower so I learnt a lot from being in the committee. I especially have to mention the former Deputy President of the RCL, Mr. Kabelo Moyo. He really inspired me. He taught me valuable leadership skills. AN: How so? – and where’s Kabelo Moyo currently? TM: Well… in general, no-one ever volunteers to lead. Kabelo was always taking the lead so that really inspired me and taught me to go ahead even when others choose not to. Kabelo went to study at the University of Johannesburg. AN: I was also in the RCL (SRC) committee during my years at Tsogo. It really is fulfilling and I think you’ll also see the benefits of joining these committees over the years – especially from a leadership and teamwork point of view. Do you feel though that your efforts were recognized? TM: In 2008, the school introduced a matric prize-giving ceremony at the end of the year. In that year, they only awarded prizes for Academic performance. In 2009 however, they broadened the categories and introduced ‘social-based’ categories. So as the RCL we were recognized at that ceremony – which I think was good for the school to do. AN: Just going back to the academic part of your matric year… How did you find the exams during the year? – especially the mock exam? TM: The tests and exams throughout the year were okay. The mock exams were totally different though. They were quite challenging. I particularly remember the Accounting mock exam…. It was the hardest exam I’ve ever written! After that exam I even thought of lowering my expectations for my final Accounting mark. AN: So how did you find the final Accounting paper? Was it anything close to the mock exam? TM: I think it was fair. To be honest, I don’t know whether the final Accounting paper was easy or whether I was over-prepared. To have it easy you have to have it tough first! AN: What else would you say contributed to your success at matric? TM: I think I worked hard. If you prepare hard, results match your work. I would also say that helping other peoplehelped me succeed as well. AN: Helping people? – that’s interesting – do you want to tell us more? TM: Sure…. I found that everytime I helped other people in my class I got to understand the subject better. So each time I explained things, I actually explained them back to myself! A friend of mine – Tiro Mmolotsi used to come to my place every weekend and we used to study together. Whenever I explained things to him I was actually not realising that I was explaining them back to myself which made me remember them more. AN: Very good values indeed! 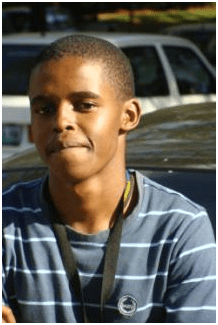 Should we skip to the 7th January 2010 – Matric Results’ Day? TM: I had subcribed for the SMS notification – but throughout the morning, everyone I knew got their results exept me. I only got my SMS much later on in the morning saying I had passed. We then went to the school to get our full results and transcripts. When I got to the school Mr. Malemane came to me and asked that I go home to change into my school uniform because the school was planning a small ceremony for matrics. He didn’t say anything about the results. So I went home to change into school uniform. In my mind I just thought this had something to do with my involvement in the RCL Executive Committee. When I got back to school later on that morning, I found everyone standing at assembly. As I got there Mrs. Mohashoa ran to me and told me I got 8 DISTINCTIONS! I said “WHAT”! I knew I had put in the effort and passed well but I just didn’t expect this! AN: I can only imagine the feeling. Must have been amazing! I’m sure it was a super feeling with the media there and everyone screaming for you. We read your story in the Pretoria News. TM: Yes – It was an amazing feeling!I just didn’t expect it. AN: You got your results – I imagine you were now relieved that you exceeded all your and everyone’s expectations. Let me take you back a bit… you got a bursary from Thuthuka Trust and Ernst & Young. How did you find the bursary application process? TM: My older cousin Steven works for Ernst and Young – he’s doing his articles there. So he’s always been telling me about the Chartered Accounting profession and about Ernst and Young. He’s been very helpful throught my schooling years and has always given me professional advice.. One day last year he gave me some Ernst and Young bursary application forms and after completing them gave them I back to him to submit for me. AN: It always helps to have a ‘big brother’ guiding you. Can you tell us more about your bursary? TM: Interestingly my Grade 11 results weren’t that ‘wow’. I didn’t have distinctions in Grade 11 so I knew that based on these results I woundn’t be the first to get a bursary – so I had to pull out the stunts! (laughs) . I knew based on my results I that I couldn’t get funding for Economic Sciences – and I had to pull out the stunts – based purely on hardwork. I didn’t have to restrict my life – purely hardwork. I still had to balance my social life with school work and I did it! AN: Tshepo – we’re sitting at NewsCafe Hatfield – quite close to your new residence. A new exciting university life is ahead of you… What would say got you here? TM: Prime focus! I initially wanted to study towards Financial Management Sciences but I realised that I wouldn’t get all the skills I wanted. But doing Accounting gave me all those skills – in Accounting I think I’ll get all these financial management skills bundled into one. I was initially afraid of Accounting so I wanted to take a short-cut. Thanks to my teachers and class-mates I got my confidence back and took Accounting head on. AN: Why did you choose the University of Pretoria? AN: How’s life at U.P and at Res? TM: People are good here at res. People are not racist here! I think for me the key is to make and build friendships based on common-interest. All my friends here build me! They are good people who share my personal interests. AN: To close off – can you tell us what your interests are? TM: I love LEARNING! I love Knowledge…. Secondly I like to be challenged – e.g. I’m not much of a public speaker but I loved the challenge. Last year in matric I enrolled for the Afrikaans Speech Exams and this really challenged me! AN: Afrikaans Speech Exams – I remember the S.A. Guild of Speech & Drama Teachers English exams we did back at Tsogo… I loved them… but I can’t recall anything for Afrikaans then. Can you tell us more? T.M: Mevrou Banda – our Afrikaans teacher engaged us to enroll in these Afrikaans exams. Then one day she spotted some interested people and organised some speech presentations in our class. I was one of the people chosen from than small group to represent Tsogo at the Provincial Afrikaans Expo. I think doing this made Afrikaans more interesting for me… it changed my perception of Afrikaans. We then went to Brits Hoerskool and competed with all other Afrikaans medium schools. I think we did well eventhough we didn’t get to the National finals. We really enjoyed the process. This really taught me Afrikaans! AN: So Tshepo – what are you seeing as you look forward? TM: University! It’s a whole new level. It’s a lot tougher here. I now have to perform on a bigger platform. It’s a lot more challenging. We cover what we used to do in school over 2 days in one lecture here! You have to be prepared to change. Leave high school behind and start on a clean slate – the work here is a lot more challenging. AN: Would you say the Thuthuka Programme has helped you? TM: Yes – definitely! The Thuthuka programme gives you a ‘kick start’ into university. We have Thuthuka students in almost all the sessions and work we do. So this helps a lot. All Thuthuka students stay in the same residence so we always stay in touch. AN: Mr. Tshepo Maubane – we salute you for your work and for flying the Tsogo flag high. Well Done and we officially welcome you and the Class of 2009 to the family of Tsogo Alumni. Please continue to move ahead and know that the large body of Tsogo Alumni is behind you. Article from the 2010 Alumni Society Newsletter. Thank you to Thabo Ncalo. Firstly, this is a very good article. Once again well done to Tshepo for his outstanding performance, he deserves all the recognition he is getting at the moment. He truly is an inspiration for the young ones we have left behind at tsogo, and he also was an inspiration for us last year throughout the year. I cant believe the shy Tshepo did it, im proud little bro keep up the outstanding performance. This is really such a great article and I think we must acknowledge what this man has done.He belongs in the Tsogos Book Of Records.